Although it wasn't mentioned during Apple CEO Steve Jobs' keynote address Monday at WWDC, Apple launched an updated version of its Safari Web browser for Mac OS X 10.5.8 and 10.6.2 or higher, as well as Windows XP SP2 or higher, Vista, and Windows 7. With the new release, Apple patched security holes, boosted performance, and introduced a handful of features that collectively have the potential to put Safari on par with Chrome and Firefox in terms of core features and performance. The most significant addition to Safari is — finally! — support for browser extensions. For a lot of users, browser extensions may seem like a non-event. It's true that other browsers — Firefox, Chrome, and IE all come to mind — have supported extensions for so long that switching to one of those browsers from Safari could easily overwhelm you with the sheer number of extensions available. The new Extensions pane in Safari's preferences. Extensions may not seem like a big deal, but it's important because it shows Apple is finally keeping pace with rival browser-makers. That doesn't mean it's letting developers run rampant, however. 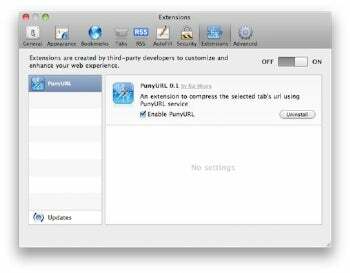 Extensions will be sandboxed to keep them from gaining unfettered access to Safari itself or to other portions of a user's computer or data. Apple also requires that extensions be digitally signed, similar to what's required for mobile apps in the App Store. That's to ensure an extension hasn't been altered by a third party and that any updates come from the original developer. One annoyance about Apple's implementation is that extensions are disabled by default. To enable them, you must use Safari's preferences to enable the Develop menu (there's a checkbox on the Advanced tab), then click on the Develop menu and select Enable Extensions. The first thing I checked out in Safari 5 was the new Reader mode. 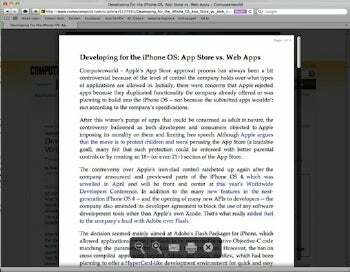 This feature uses heuristic scanning of a Web page to determine whether the text there can be displayed as an article. If so, the address bar displays a Reader button. Clicking on that button will display the text portion of the page in an overlaid window that pops up. The overlay doesn't show images or ads, but it does include links. Personally, this goes down as my favorite new feature in Safari and one that differentiates it from other browsers. However, the scanning technique isn't always perfect and occasionally articles aren't recognized as such. When that happens, the Reader option isn't displayed. I expect this to get better as it's refined over time. With Safari 5, Apple caught up to Chrome's performance, partly by taking lessons from Chrome and other browsers. Like Chrome, Safari now relies on DNS pre-fetching to speed up page loading. Improvements to Safari's caching routines also speed up the loading of images and pages that have been previously viewed.